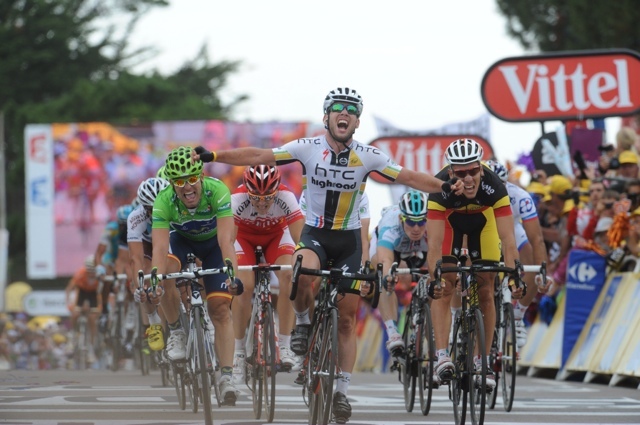 Mark Cavendish (HTC-Highroad) is off the mark at the 2011 Tour – but how he had to fight for it. He took the fifth stage of the Tour de France on Wednesday afternoon, beating Philippe Gilbert (Omega Pharma-Lotto) and Jose Joaquin Rojas (Team Movistar) into Cap Fréhel. In a twisty, tumultuous finale that saw no team take control, Cavendish showed his guts and pure speed, coming from ten back to fire past his rivals to overhaul Gilbert in the final 50 metres of the slightly-uphill finish. Without teammates inside the final kilometre, it looked bad for the Manxman. But he latched onto the wheel of Geraint Thomas (Team Sky) and fought his way to his 16th Tour de France stage win. “That wasn’t a bunch sprint, that was real hard at the finish,” Cavendish said afterwards of the tough closing kilometres. 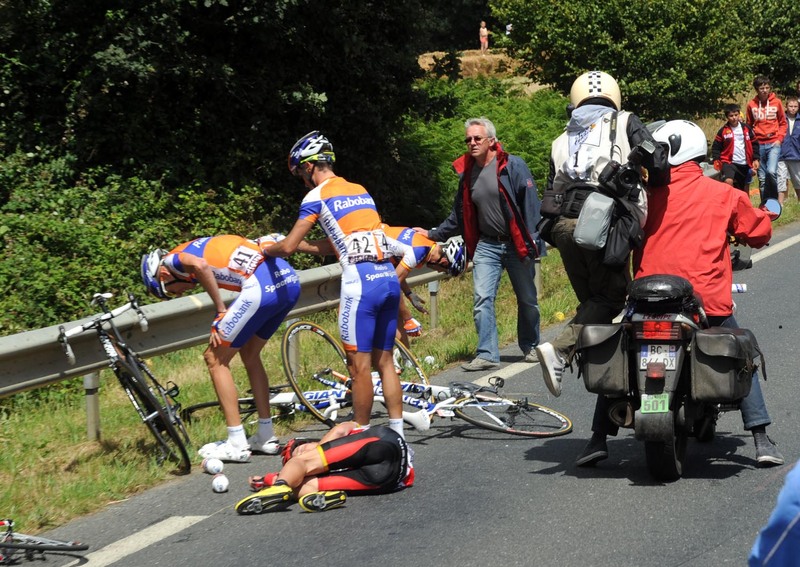 The 164.5km stage on the circuitous, narrow roads of northern Brittany was littered with crashes. A fall halfway through the day saw Alberto Contador (Saxo Bank-Sungard) and Robert Gesink (Rabobank) among a group who went down. Sky leader Bradley Wiggins was also disrupted. However, worst off was RadioShack leader Janez Brajkovic, who was forced to abandon the race, along with Christophe Kern (Europcar). Meanwhile, Danish champion Nicki Sorensen (Saxo Bank-Sungard) was involved in a bizarre crash, which saw a race motorbike snag his bike and knock him off. A later fall took down Tom Boonen (Quick Step), leaving him to limp to the finish thirteen minutes down. At the day’s intermediate sprint, Vacansoleil man Borut Bozic crossed the line first. Cavendish initially finished nine back, as Rojas and Boonen deviated in front of him. However, the commissaires declassified the pair at the finish, meaning that the green jersey moves from the Spaniard’s shoulders to Philippe Gilbert. 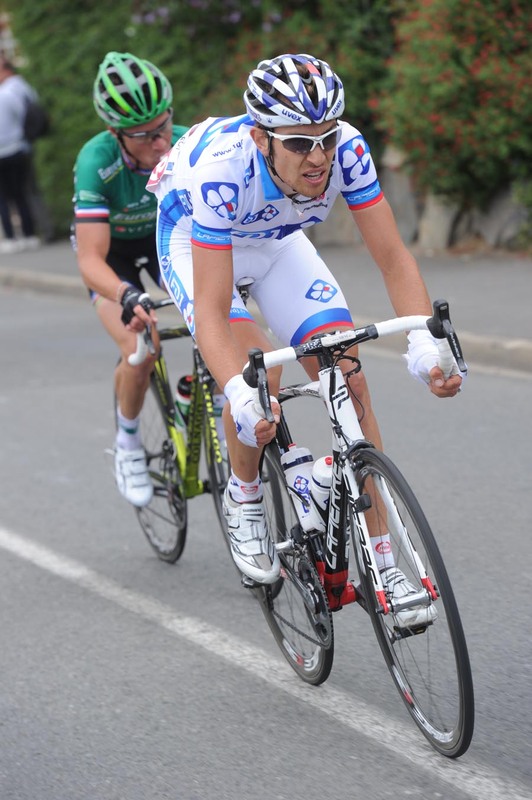 Once the day’s chief breakaway of Anthony Delaplace (Saur-Sojasun), Jose Ivan Gutierrez (Movistar), Tristan Valentin (Cofidis) and Sebastien Turgot (Europcar) was caught with 40 kilometres to go, Thomas Voeckler (Europcar) and Jeremy Roy (FDJ) made a bold bid for success. However, after briefly resisting longer than his compatriot, Voeckler was pulled back in the outskirts of Cap Fréhel. As the sprinters’ teams grappled for control after a rolling finale, Edvald Boasson Hagen (Team Sky) made a brief lone break inside the final 800 metres. But it was down to Cavendish to deliver the finishing touch. 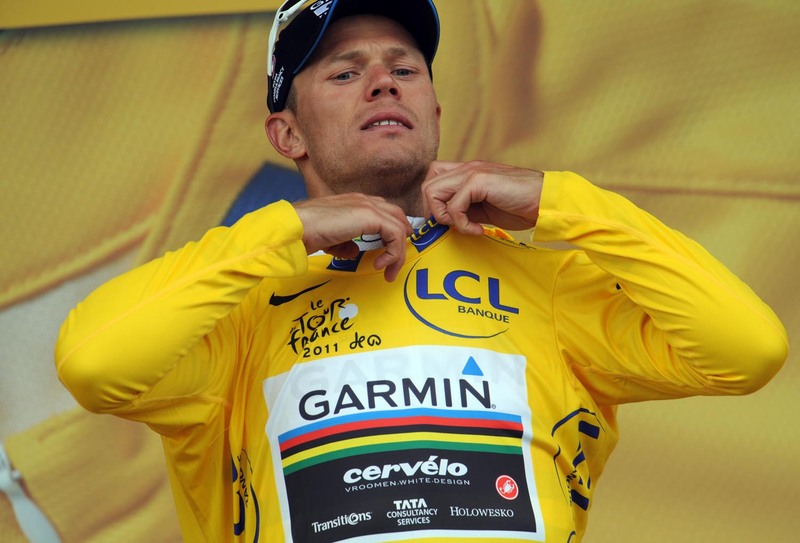 Thor Hushovd (Garmin-Cervelo) safely retained the race lead from second-placed Cadel Evans (BMC) at one second. Frank Schleck (Leopard Trek) is third at four seconds, with Britain’s David Millar in fourth at eight seconds. British Sky pair Bradley Wiggins and Geraint Thomas kept their sixth and seventh places overall at 10 and 12 seconds respectively. Tomorrow’s sixth stage covers 226.5 kilometres from Dinan to Lisieux. Although lumpy, it offers the HTC-Highroad star Cavendish another opportunity to make up ground on his green jersey rivals.